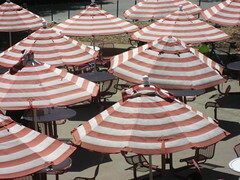 Left: Bright and colorful Stanford Red umbrellas grace the campus. OpenSocial, a promise made, but little has been seen. Not sure what OpenSocial is? Here’s how I explain OpenSocial to Executives. If you want to learn more, then join us as I’ll be moderating a panel at Stanford Business School in Palo Alto this coming Tuesday, Feb 19th on the topic of the distributed web. Why Pursue a Multi-platform social network strategy? Find Out the Pros and Cons. Part of why I got this fantastic gig to speak was because of my recent post on How to Successfully moderate a panel, I’ll be following many of those best practices as I listed out. One of the suggestions I made is to get audience feedback to gauge what success would look like. So, if you were me, what questions would you ask the panel? Leave a comment below, I’m listening and will credit you if the question is asked.